"Poor Barrell's Regiment were sorely pressed by those desperadoes and outflanked. One stand of their colours were temporarily taken. Colonel Riches hand was cut off in their defence." Captain-Lieutenant James Ashe Lee of Wolfes' 8th Foot. 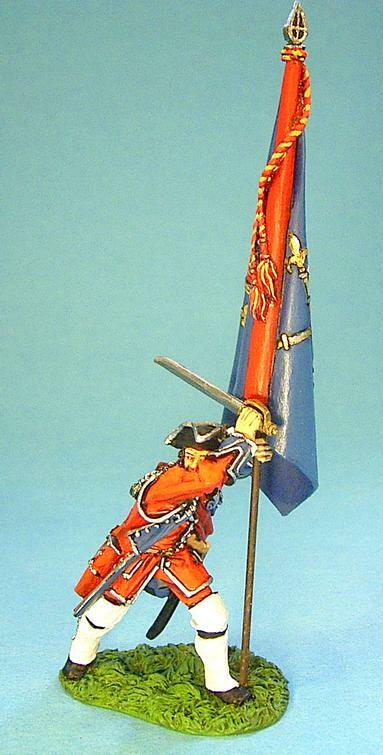 The Regiment or Colonel's Colour for the 4th Regiment of Foot was unique as it had a gold crown and scepters on a blue ground, with no union in the upper canton. It was in 1747 that new regulations were introduced to standardize these colours.